The E-Pace isn’t the dynamic class-leader Jaguar says it is, primarily due to its considerable weight, but there is plenty to like. It looks the business, is pleasant inside, has enough practicality for a small family, and comes with lots of luxury toys. However, it’s not cheap to buy or run, and it’s up against some very good rivals in the Audi Q3 and BMW X1. Enough pace and a price that isn’t too ridiculous. The only version to achieve official fuel economy upwards of 60mpg. Extremely expensive and not fast enough for the sportiest E-Pace. Interested in buying a Jaguar E-PACE? 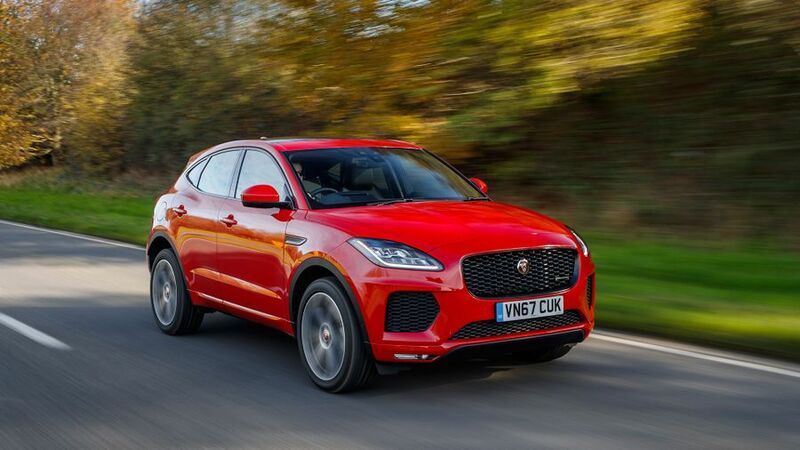 Jaguar is very keen that the E-Pace stands out as the sportiest car in the small SUV segment, so it’s taken plenty of design cues from the F-Type sports car. The headlamps are of a very similar shape to those of Jaguar’s flagship, and you’ll also notice a very similar light signature in the rear lamps. 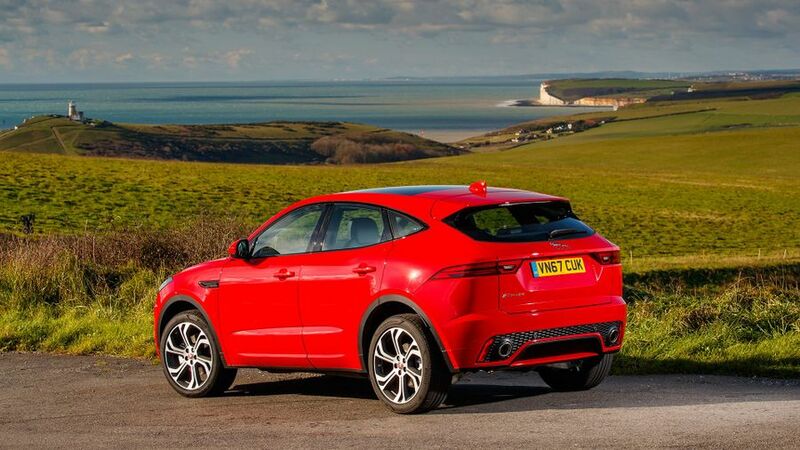 In fact, it’s at the back where the E-Pace’s design is most impactful, where the steeply raked screen – along with bodywork that tapers away beneath the rear lights – helps deliver a really muscular look. All versions come with twin exhausts and a tailgate spoiler, but if you specify one of the R-Dynamic versions, you’ll also get a body kit, a gloss-black grille and a few extra bits of chrome. The E-Pace might be the smallest car Jaguar makes, but that doesn’t mean it feels like a poor relation. Most of what you see and touch gives you that important feel-good sensation. One or two of the interior surfaces feel a little harder or flimsier than you might expect in a premium car, but that’s the case in pretty much all of Jaguar’s products, and the E-Pace easily matches any of them for quality, even if it can’t quite match its rivals from Audi and BMW on that score. The various switches and dials are typical Jaguar fare, too, meaning most are simple to find and use, and you also get the same touch-screen infotainment system found in other Jaguars. That means it offers lots of functionality, but it’s not as intuitive or as polished to use as the best systems on the market. The seats are very supportive and the driving position has plenty of adjustment, but while that swoopy bodywork looks great, it doesn’t do much for your visibility. The small back window and chunky pillars either side hamper your rearward view, and the combination of thick windscreen pillars and bulky door mirrors also cause some blind spots at the front quarters of the car. The whole reason SUVs are so popular is due to their combination of style and practicality, so this is an important area for any SUV, even a small one like the E-Pace. It does a decent job. In the back there’s room for a couple of taller adults, but limited shoulder space, a bulky centre tunnel and narrow middle seat mean squeezing a third person in will be just that. The boot is a decent size by the standards of the class, too, and it comes with a useful array of hooks and straps to help you keep things secure. 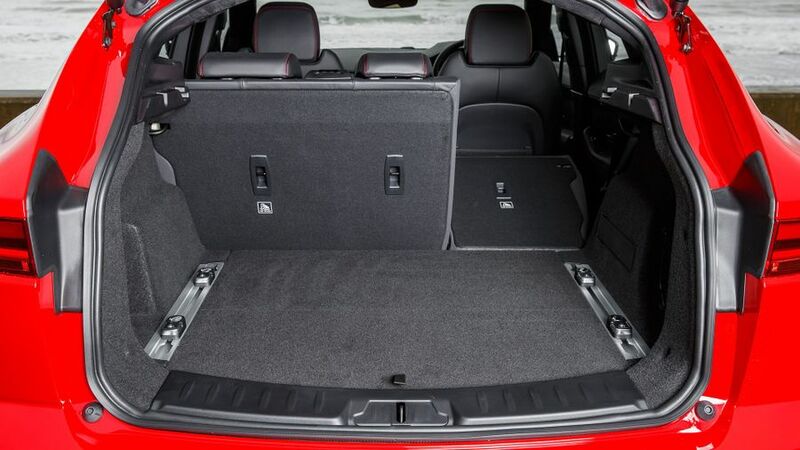 However, there’s a lip to negotiate when loading heavy items (it’s not that high, but it’s irritatingly wide) and the backrests of the rear seats lay at an angle when you fold them down to carry larger loads. Jaguar is quite insistent the E-Pace is intended to sit at the sportier end of the otherwise-not-massively-sporty small SUV market. 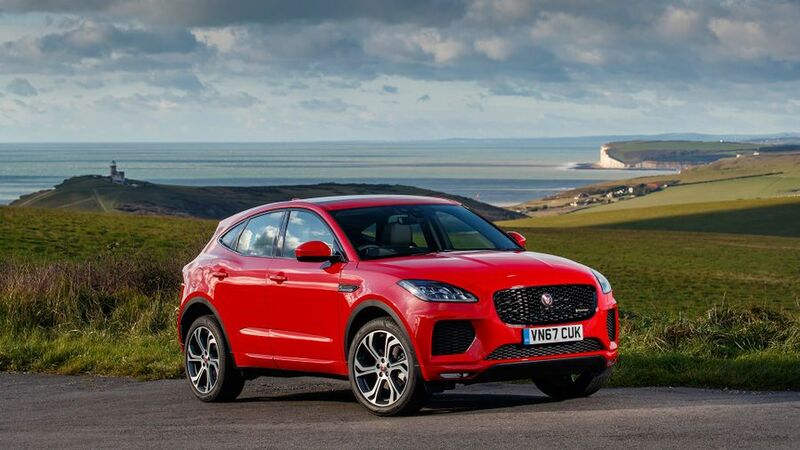 That – combined with Jag’s impeccable form in producing cars that are wonderful to drive – might well lead you to expect the E-Pace to really dazzle in this area. Unfortunately, it doesn’t. The problem is weight. It’s exceptionally heavy compared with pretty much all its rivals, and you can really feel all that weight shifting around as you change direction. The tyres always do a sterling job of maintaining their grip on the road, but it always feels like they’re having to work really, really hard to do so. The car’s heft can also be felt when you’re trying to slow down or stop in a hurry, because the brakes need a good old shove to deliver the amount of stopping power you need. The car does have quite an alert, pointy character because the steering is really quick and responsive, and the firm suspension does a good job of keeping body lean in check. 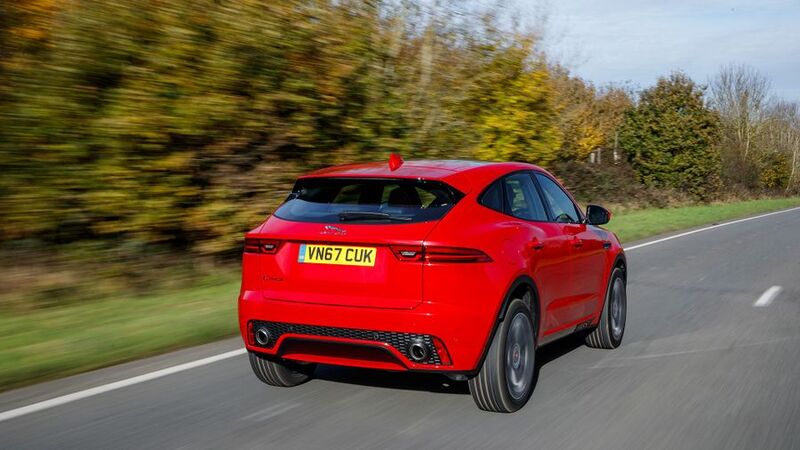 But, given the promises of sportiness Jaguar makes with the E-Pace, it needs to combine all that with agility, and unfortunately, it’s physically impossible for a car carrying so much weight to as feel nimble as buyers will want. That firm suspension also means it’s not the most comfortable car you’ll ever drive, with plenty of knocks and jitters to be felt in the cabin. It stops short of being uncomfortable, but you’ll certainly feel more pampered in rivals from Audi and BMW. The E-Pace can be had with one of five engines, all 2.0-litre units, three diesels and two petrols. The diesels deliver 150, 180 or 240 horsepower. The most powerful comes only with four-wheel drive and a nine-speed automatic gearbox, but the mid-range one is also offered with a six-speed manual, while the entry-level engine can be had with both a manual gearbox and front-wheel drive. We've found the 150 horsepower version to be lacking grunt, which is at odds with the car's sporty character, and leaves it feeling underpowered. It'll be fine if you like the looks of the E-Pace and have no intention of driving with any speed, but otherwise you could soon find it frustrating. The mid-range automatic is perfectly adequate. It’s not particularly quick – due in no small part to all that weight – but it does a decent enough job in hauling all that mass around without having to work its socks off. The 240 horsepower engine is better if you're after more excitement, with a good swell of power for overtaking. The two petrols on offer have an impressive-sounding 250 or 300 horsepower. Both come only with the automatic gearbox. However, the performance of both isn’t nearly as impressive as the numbers suggest. The 250 version feels oddly pedestrian, even with the car set to Dynamic mode, and doesn't deliver the pull and excitement you might expect. The same is true of the 300 horsepower version; you can floor the accelerator pedal, and it feels like the noise made by the engine shoots up far more than your velocity does. It’s not slow by any means, but you’ll probably be expecting far stronger acceleration from what is supposed to be the sportiest version of the E-Pace. 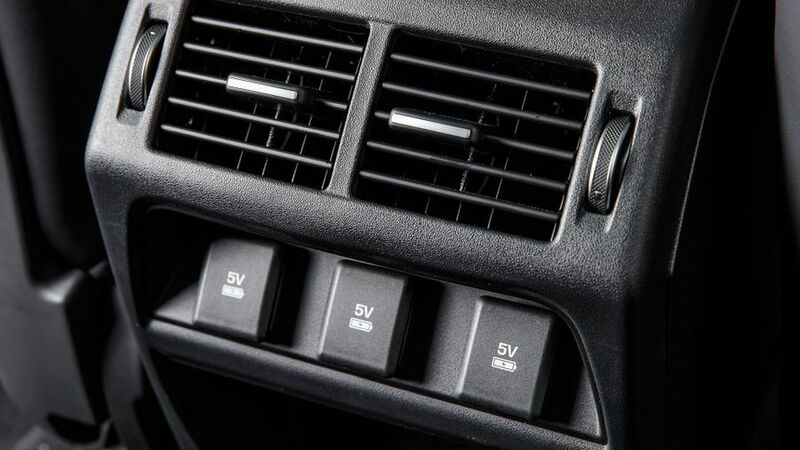 The automatic gearbox is impressively smooth, but it could be a little quicker to react, both in normal automatic mode, and when you decide to switch gears yourself using the steering wheel-mounted paddles. The manual is decent, with a firm, meaty action to the lever and a low bite-point on the clutch. This is another area in which the E-Pace is hurt by its weight. 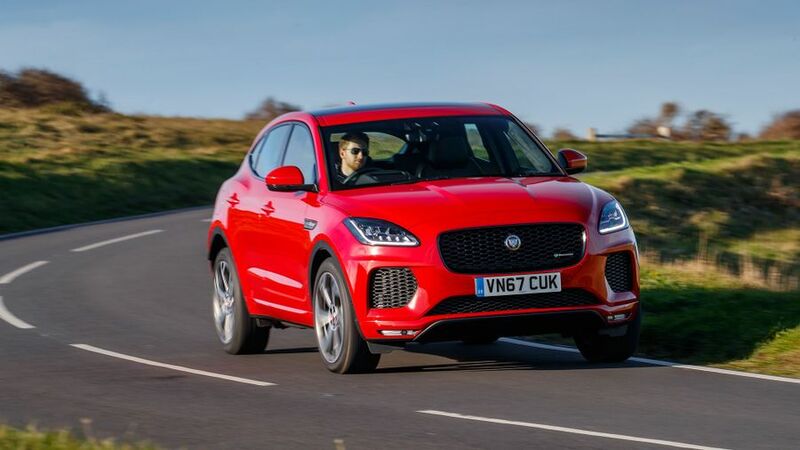 Compare its official fuel consumption figures with those of the equivalent versions of the Audi Q3 and BMW X1, and the baby Jag is behind its rivals every step of the way. And, because CO2 output is intrinsically linked to that, your bills for road tax or company car tax could well be higher, too. It’ll also cost you a fraction more to insure and maintain. Compare purchase prices, and the E-Pace looks a bit more expensive to buy, too, and the more expensive E-Pace models start to tread on the toes of bigger SUVs on price. Encouragingly, the Jag is predicted to hold its value a little better than its rivals, which means more money back when you sell your car on, which in turn means more affordable whole-life costs. 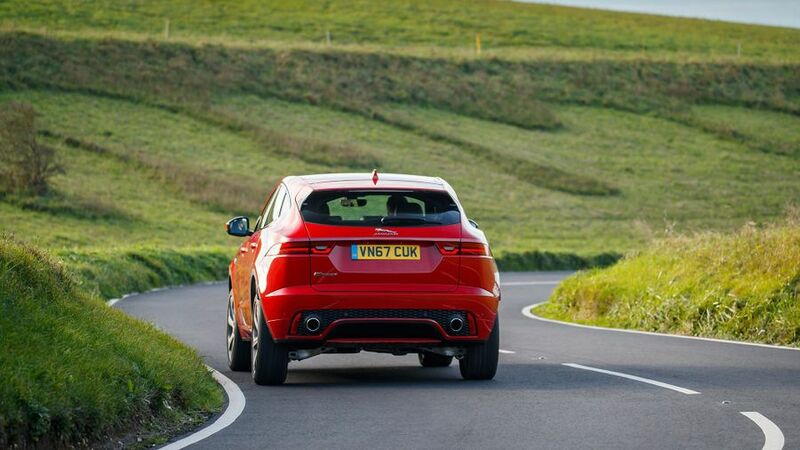 Jaguar’s reliability record has been rather hit-and-miss in the past, and the fact that the brand sits in the lower reaches of the manufacturer rankings in Warranty Direct’s Reliability Index might not inspire a great deal of confidence. However, look at the standings again, and you’ll notice Jaguar actually ranks higher than all its German premium competitors in Audi, BMW and Mercedes, and that should provide some encouragement. That's enhanced by a stronger-than-average performance in JD Power's 2017 Vehicle Dependability Study. 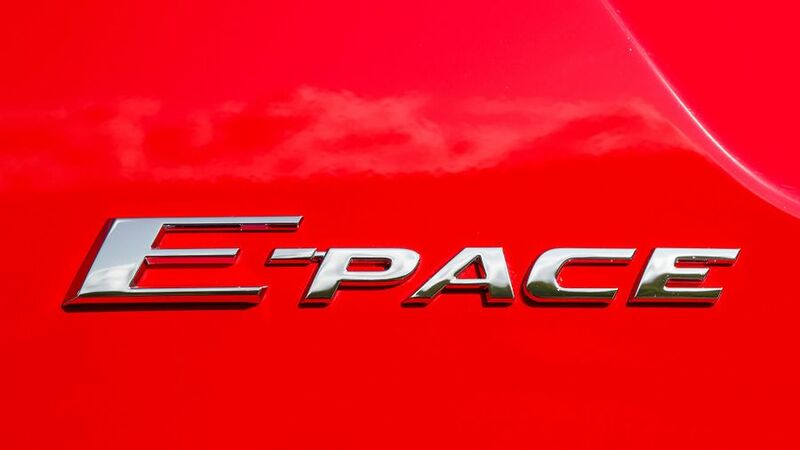 Like all Jaguars, the E-Pace comes with a three-year/unlimited-mileage warranty, which is similar to what you get from rival brands, and this can be extended by another year for a fee. 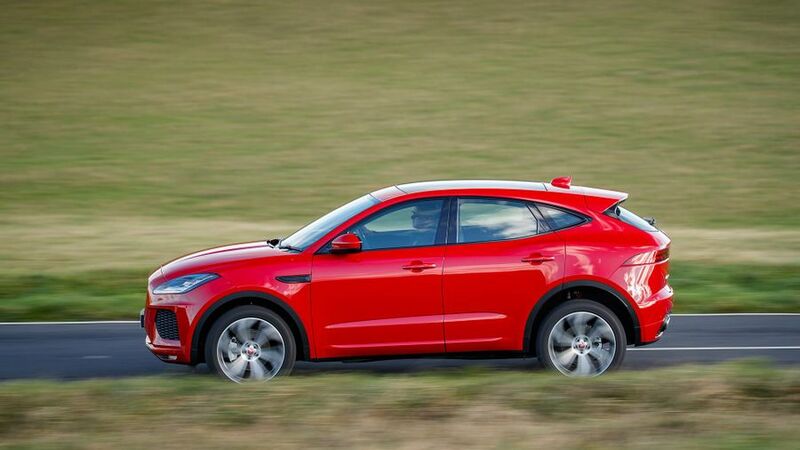 The E-Pace comes with all sorts of clever electronic driver aids to help you maximise grip and traction, and along with the four-wheel drive that comes on all but one version, they should help you avoid trouble in the first place. Automatic emergency braking also comes as standard which warns you of an impending incident and applies the brakes if you don’t. If it transpires that you can’t avoid trouble, there are six airbags to help protect those inside the car, and even pedestrians get airbag protection. However, you do get increased safety provision as you climb up the range. S gives you traffic sign recognition and adaptive speed limiter, along with 360-degree camera and a self-parking function. SE gives you headlamps that automatically switch between full- and dipped beams. The E-Pace hasn’t yet been crash-tested by Euro NCAP. 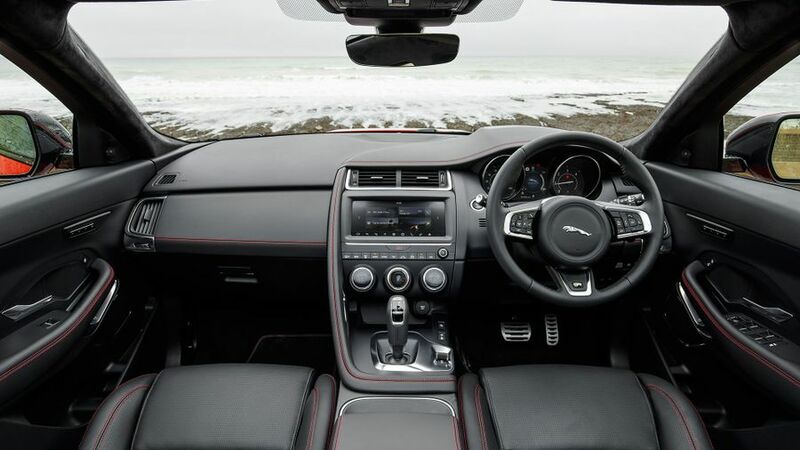 The entry-level E-Pace comes with automatic lights and wipers, climate control, cruise control, all-round parking sensors, alloy wheels and Jaguar’s touch-screen infotainment system that brings together Bluetooth, voice control, digital radio and a reversing camera. Upgrading to S trim also upgrades this system to incorporate sat-nav and a wifi hotspot, and it also gets you electric leather seats, so we reckon it’s well worth the extra cash. If you have more to spend, SE gives you a powered tailgate, a more powerful Meridian sound system and an adaptive cruise control system that does the hard work for you when you’re trundling along in traffic. The range-topping HSE adds a digital driver display, keyless go and a gesture control for the powered tailgate (you can open it by waving your foot beneath the rear bumper). Primarily because you’ve fallen for its dramatic looks and premium image, but there’s plenty to like besides that, namely a smart, practical interior and lots of luxury toys. It’s not without its flaws, and it’s not cheap to buy or run. But, if you’re sold on those looks, you’re probably halfway through writing your cheque already.